Right now, the market for scooters around the $200 mark is huge. And of course, some bring far more to the table than others. Typically, paying this kind of entry-level price means considering what it is that matters most to you. The reason being that you’re not going to get everything a board can offer for such a low price. The question is – what does the Hoverheart Self Balancing Scooter give you for your $200, and what’s missing from the equation? Well, you only need to check out the reception the Hoverheart got when it emerged a while back to understand what it’s all about. In terms of looks, special features and technology under the hood the Hoverheart Self Balancing Scooter seems to pack way more than its price indicates. Almost to such an extent that it seems too good to be true. So what’s the story when the Hoverheart hits the road? Does it live up to the hype, or is it just too much to ask for a $200 scooter? 1) First and foremost, you don’t have to worry about safety with the Hoverheart. It’s been subjected to the usual 159 tests to earn full UL 2272 certification. So when it comes to battery safety, you know you’re covered. 2) The 6.5-inch allow wheels are coated in solid rubber tyres, meaning no problems with punctures or tyre pressures along the way. Far from limited to smooth surfaces only, the manufacturer sings the praises of the Hoverheart Self Balancing Scooter on a variety of surfaces – on and off-road. 3) Most of the varieties on the market right now come in serious, impressive chrome finishes – blue, gold, rose gold and more. This thing seriously stands out from the crowd. 4) Unlike a fair few scooters in the same price range, the Hoverheart Self Balancing Scooter features a high-quality Bluetooth for taking your tunes on the go. 5) Twin 200-W motors deliver plenty of power to the wheels, while charging times come in at an average two to three hours max. 6) According to the manufacturer, the Hoverheart Self Balancing Scooter is good for speeds of 6mph to 10mph tops, along with a maximum range of around 12km. 7) Great for use in darker conditions, the Hoverheart also has a whole bunch of extra LEDs that go all the way up to the top of the wheels. Great for safety, great for looking good! 8) And as would be expected, the maximum weight limit for the Hoverheart Self Balancing Scooter is the usual 220lbs. So now onto the guts of the thing – how did the Hoverheart perform when put to the test? More importantly, should you go out and buy one right now? Well, right out of the box there’s no denying how impressive the thing looks. That chrome paint job is eye-popping and gives the board a real premium feel. Likewise, it’s nice and heavy, though not excessively so – far from flimsy in any case. In my experience, the three-hour end of the charging time estimate is the most accurate – I never filled it in anything close to two hours, anyway! Still, three hours later it was ready for me to put it through its paces. Typically, scooters with a 220lbs limit feel a bit labored under my 200lbs frame. With the Hoverheart Self Balancing Scooter, this wasn’t the case at all. It honestly felt as if I could have stepped on it with my wife on my shoulders and it’d still have done the business! Not that I would, but still – very impressive build quality and power. Once you get moving, it’s the stability and responsiveness of the Hoverheart that stand out as most impressive. Though it’s not mind-blowingly fast, it nonetheless has the kind of smooth ride and power that are so much more important than speed. It cruises at around 6mph on most smooth surfaces, which is more than enough for most purposes: taken off-road, grass and hard dirt are no problems for the Hoverheart. I didn’t test it on snow or sand and nor would I advise doing so, to be honest! The range of the Hoverheart was also solid enough – 10km to 12km, depending on the surfaces and inclines. Speaking of which, uphill stretches were dealt with as easily as flats. Which is pretty impressive for such an affordable board. Plus the Bluetooth speaker is way more powerful and capable than I expect for this price range. As for the downsides, trust me when I say that chrome finish isn’t going to last long if you don’t treat it with extreme care. Quite simply, it peels and scratches off at the first knock! Aside from this, the only real bugbear is the lack of waterproofing, which means that once it starts raining, you’ll need to pack your Hoverheart away and find another way of getting home! Referring back to what I said right back at the beginning, buying an entry-level scooter will always mean sacrificing some things for the things you really want. 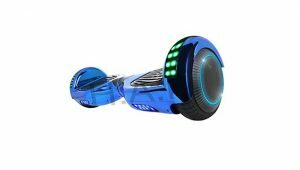 In the case of the Hoverheart Self Balancing Scooter, you get a great Bluetooth speaker, brilliant LED lights, and solid power. What you don’t get is waterproofing, fast charging or paint that stays in place for the duration! Still, it all adds up to outstanding value for money and the kind of $200 board that’s no less than a bargain. 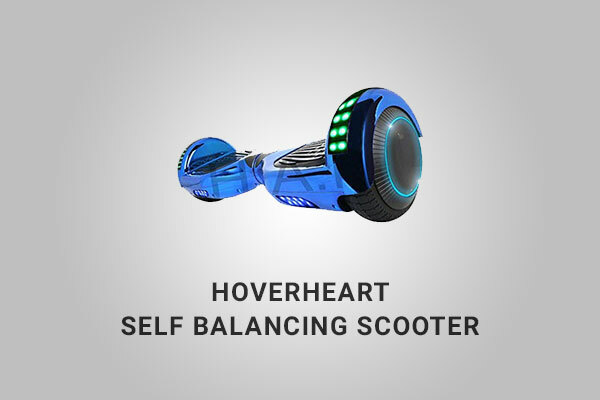 Whether looking for a toy for the kids or a reliable workhorse to get you to and from the office, you’ll find all this and more in the impressive Hoverheart Self Balancing Scooter. Do u have a burning smell coming from yours? I also keep thinking I smell something burning when I ride on mine. It makes me charge mine in the same room that I’m sitting in…I don’t let it out of my sight . Hi Christina, Please contact the manufacturer. We bought our daughter the pink Bluetooth hoverheart. The battery will not fully charge. I can not get in touch with anyone to help me. I have emailed and called the company with no luck. Hoping it’s as simple as a new charger or new battery. I can not return as I bought it on black Friday and we didn’t inbox until Christmas eve so a return is out of the question. Just means your putting most your weight on that one side thats litup! Nothing wrong! Looks good and rides well for my 10 year old daughter. But how does the Bluetooth connect? I can’t find it to link the t with my iPhone and I can’t find a user manual anywhere except for the vague instruction book which has no info regarding controlling the Bluetooth or (hopefully) volume control. Any guidance will be helpful. Easy! Just go onto settings, then go to Bluetooth and connect to VEEKO and then ur all done and Bluetooth away! Hoverboard will not charge at all! Purchased a new battery and when that one went dead it still won’t charge. The charger stays green instead of changing red when charging. Worst Christmas ever for my daughter! You need to buy yourself a new charger. The charger has probably been damaged, seen this a thousand times. Always test with a borrowed charger from a friend before investing in a new battery. If your battery is dead that is. If you want to test if the battery is bad while its still working you can stand against a wall and ride into the wall, just make sure to hold on to something. If the battery is bad it’ll die and you will have to plug in the charger before you can get it to start. Then a new battery is needed. Where did you find a new battery? What kind of battery did you get to replace it? I got 2 boards and both died 5 months later. I am not sure what to buy to replace it and of course hoverhearts customer service is absolutely non existent. Worst product and service ever. 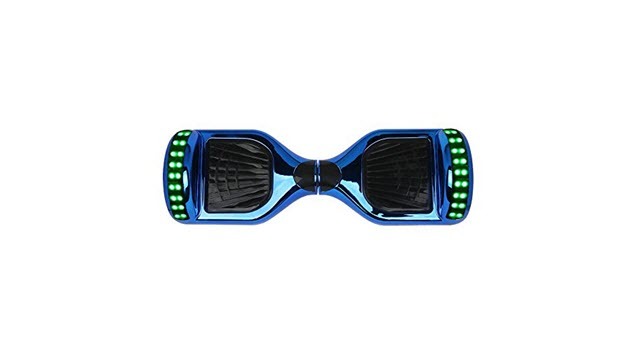 I also bought this hoverboard and it will not charge at all. It was also a christmas gift to my son. I tried to contact Hoverheart, they don’t answer at all. I also submitted a product return form online (which I can’t find again). Nobody got back to me yet. Worst product and a rip off. Fully agree. Stay away from this product. It’s no wonder they’re selling at bargain prices. They’re a ripoff. Ordered 2 hoverboard for my grandkids for Xmas and 1 totally quit working the day after Xmas the other one right side lights quit working tried to contact customer service by phone and email and got no response! Very dissapointed grandkids! Ruined my Xmas for these 2grandkids! Never order thru hoverheart again and advised family and friends same! Very disappointing Xmas for these 2………..
Have you had any response from them? I AM going through the same thing right now! Did you figure out the hoverheart issue? I just bought my daughter the rainbow one and it won’t work as well. Every time I use my hoverheart and it’s about to almost die the wheels act stupid and take me off what do I do ? I got my son one for Christmas and within 2 weeks it went crazy! He can not even ride it! I call the company an sit on hold forever no one answers and I have sent an email… but heard nothing back! I did not spend $200 for something to last 2 weeks nor crappy customer service from your company! Bluetooth does not work. Need to know what to do, this has been a bad time for someone that has been wanting one for a long long time.. I received the hoverheart yesterday. The charger sparks when plugged into the wall. I powered it on today to see if it would work but I had no luck. It’s a rip off. Don’t purchase it. Hi, I have a question mines is beeping loud and only one side moves, did you have that problem if so could you email me directly we need help!! I also bought a hoverheart for my daughter for Christmas, and it lasted about two weeks. It will not charge, even after being plugged in for hours. Worst product ever! I just got one for my granddaughter hers. See her and her Daddy have been wanting to get her one but before it happened her daddy passed away so I thought this would put a smile on her face so I purchased one for her we received it 7/9/2018 maybe has ridden it maybe 45 min it will not charge and then when it says it was fully charged she took it outside got on it and now it continues to beep it will not stop and also says its not charged. So I hope they replace this or fix it. My granddaughter is 9 years old she went out got a hat with her dads and her last name BOSTON so she could wear it when she rides it and it will not work. Please, I hope you replace this because my granddaughter is very devasted. Do you get a free warranty? My board is all ready fried and we got it in February. We tried charging and held down on the power button. So does Hoverheart come with a FREE warranty? Ours keeps beeping until we unscrew the board and unplug the battery. when we plug it back in the beeping has stopped and it will run just fine but as soon as we touch the power button the obnoxious beeping starts again. I have not been able to get in touch with ANYONE about this! 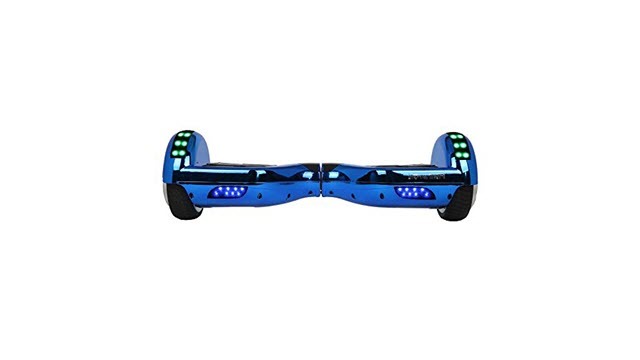 I ordered my grandsons the 6 1/2 inch Hoverheart hoverboard about a year and a half ago. It only worked a few times. Great customer service sent a new one. After a few uses it would not take a charge. My grandson did not let me know for over a year. I sent them a new charger, still did not work. They brought it to me this summer when they came to visit. I trouble shot and found one capacitor on the mother did not have any solder on one leg and one transistor has a cold solder joint (causes bad contact) and it looks like a couple transistors are blown. This would be the reason the voltage coming out of the MB to the battery is only 22.8 vdc when the charger is putting 42 vdc in. It seems they have very bad quality control. I am trying to find out which mother board it has so I can install a new one. These things are very easy to work on, but I guess they need to be. Not worth the $250 I paid. My hover board isn’t working! I just fully charged mine and I pressed the on button. Then nothing happened. I already tried many times and it’s still not working! Can someone tell me what am I doing wrong? My hoverheart board doesn’t work! The board is not balenced whatsoever. My mom tried to take it back because she got it online. This brand is unexceptable! I agree and can’t get in touch with company. I bought my granddaughter the hooverheart for Christmas I can fully charge it and it will only last about hour before it is dead again. Got one for my daughter for Christmas this year. On Jan 6, 2018, she got on to ride it and it threw her off. Wheels are spinning out of control and even after she fell off the hoverboard continued to spin out of control and flew across the room and hit the wall before it finally stopped. Can’t even find a phone # or email address for company. I have an insurance policy through Walmart, but they won’t honor it because the company has a warranty on it. Why did I buy either one! Can this company be sued for putting children at risk? How can I connect the iPhone with the Bluetooth overboard? All the board does is beep nonstop when my child tries to use it. POS!!! Only had for a couple weeks…one side works and the other doesn’t…charger shows fully charged..hover board shows fully charged…but it won’t stop beeping…what is going on??!! Does anyone have suggestions how to get Hoverheart customer service? I have emailed and phoned and No response! Daughter used for less than 2 hours and eight wheel locked up. I tried everything in the instructions without results. I’ve been trying to get in touch with company for over a week and they won’t respond by phone nor e-mail. I would never recommend this device. My daughter is devastated. Worst Christmas gift ever.